The Global Volcanism Program has no activity reports for Mammoth Mountain. The Global Volcanism Program has no Weekly Reports available for Mammoth Mountain. The Global Volcanism Program has no Bulletin Reports available for Mammoth Mountain. Mammoth Mountain, a trachydacitic lava-dome complex, lies on the SW topographic rim of Long Valley caldera. It is west of the structural rim of the caldera and considered to represent a magmatic system distinct from other nearby volcanic regions (Hildreth, 2004). The latest magmatic eruptions took place about 57,000 years ago. Mammoth Mountain is surrounded by at least 35 mafic vents that are part of the same magmatic system and include Red Cones, two closely spaced basaltic cinder cones located SW of Mammoth Mountain and SE of Devils Postpile National Monument. The cones, whose name derives from colorful mantling scoria deposits, are unglaciated and were radiocarbon dated at about 8500 years ago. Phreatic eruptions, distinct from those at South Inyo Craters, took place about 700 years ago from vents on the north side of Mammoth Mountain. Recent unrest, including seismicity, gas emission, and tree kill, is thought to be related to dike intrusion beneath Mammoth Mountain in 1989. Bursik M, 2002-. Long Valley tephra database. http://www.volcano.buffalo.edu:9090/mmvz. Hildreth W, 2004. Volcanological perspectives on Long Valley, Mammoth Mountain, and Mono Craters: several contiguous but discrete systems. J. Volcanol. Geotherm. Res., 136: 169-198. Hill D P, Prejean S, 2005. Magmatic unrest beneath Mammoth Mountain, California. J. Volcanol. Geotherm. Res., 146: 257-283. Huber N K, Eckhardt W W, 1985. Devils Postpile story. Sequoia Nat Hist Assoc, 30 p.
Huber N K, Rinehart C D, 1967. Cenozoic volcanic rocks of the Devils Postpile quadrangle, eastern Sierra Nevada California. U S Geol Surv Prof Pap, 554-D: 1-21. Sorey M L, Evans W C, Kennedy B M, Farrar C D, Hainsworth L J, Hausback B, 1998. Carbon dioxide and helium emissions from a reservoir of magmatic gas beneath Mammoth Mountain, California. J. Geophys. Res, 103: 15,303-15,323. From: Tizzani et al. 2009. Reference List: Thatcher and Massonnet 1997; Fialko et al. 2001; Hooper et al. 2004; Tizzani et al. 2007; Tizzani et al. 2009;. Thatcher, W., & Massonnet, D., 1997. Crustal deformation at Long Valley Caldera, eastern California, 1992-1996 inferred from satellite radar interferometry. Geophysical Research Letters, 24(20), 2519-2522. Tizzani, P., Battaglia, M., Zeni, G., Atzori, S., Berardino, P., & Lanari, R., 2009. 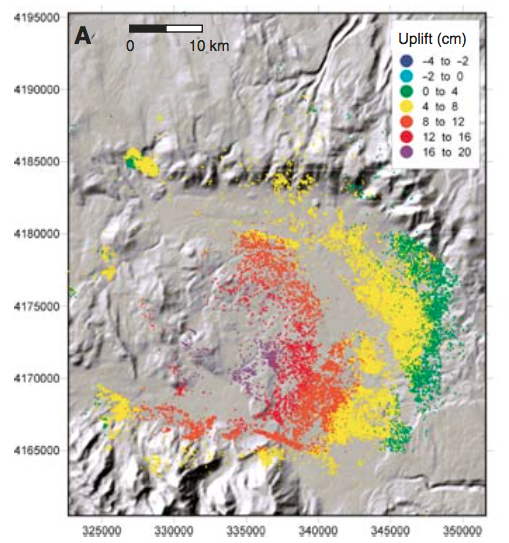 Uplift and magma intrusion at Long Valley caldera from InSAR and gravity measurements. Geology, 37(1), 63-66. Tizzani, P., Berardino, P., Casu, F., Euillades, P., Manzo, M., Ricciardi, G.P., Zeni, G. and Lanari, R.,, 2007. Surface deformation of Long Valley caldera and Mono Basin, California, investigated with the SBAS-InSAR approach. Remote Sensing of Environment, 108(3), pp.277-289. There is no Emissions History data available for Mammoth Mountain. 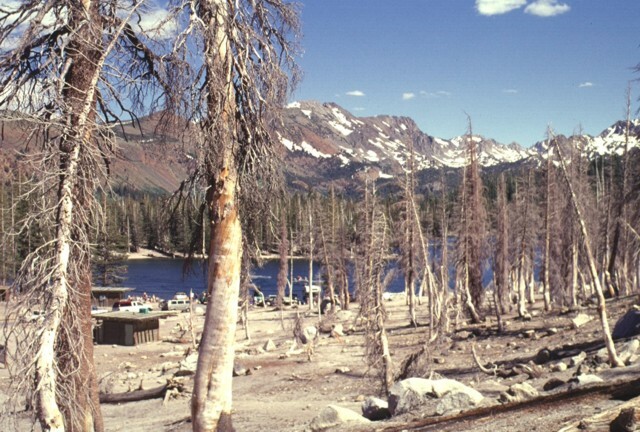 In 1995 soil gas fluctuations caused tree dieback at Horseshoe Lake on the SE side of Mammoth Mountain. A period of unrest including uplift and seismic swarms has continued for more than a decade. Mammoth Mountain rises to the SE of Minaret Summit. The 3369-m-high volcano formed between about 111,000 and 57,000 years ago and consists of a series of trachydacitic and rhyodacitic lava flows and lava domes. 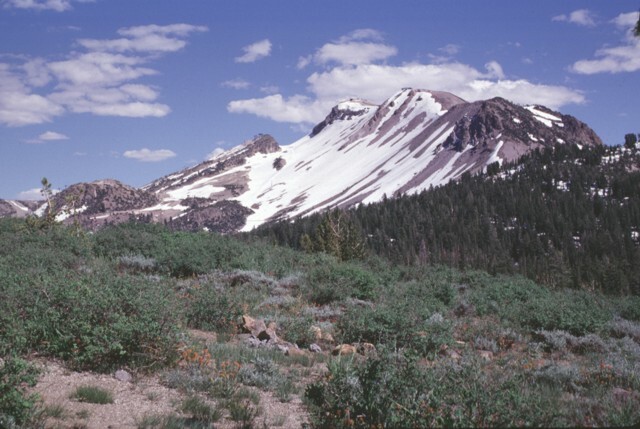 Magmatic activity at Mammoth Mountain overlapped the latest eruptions of the Long Valley caldera and ended prior to the onset of eruptions at the Mono-Inyo chain, although phreatic eruptions on the northern flank of Mammoth Mountain took place during the Holocene. 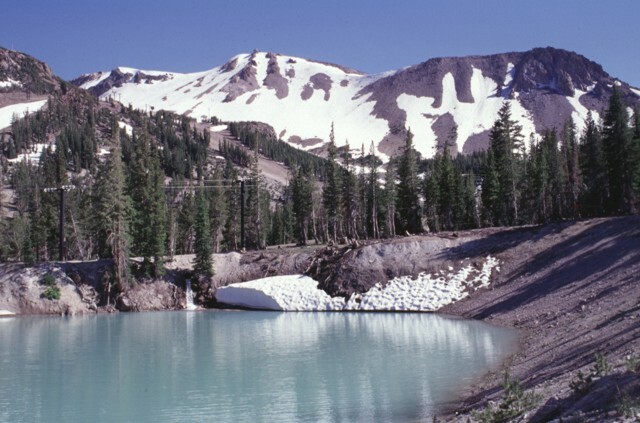 Water partially fills a phreatic crater formed on the northern flank of Mammoth Mountain, the snow-covered peak in the background. This and other nearby craters were formed by explosive eruptions about 700 years ago that were distinct from nearby eruptions at the southern end of the Inyo Craters. 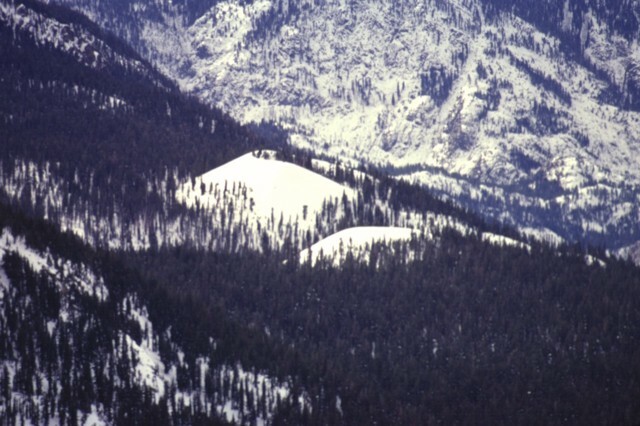 The Mammoth Mountain craters, some of which lie within the Mammoth Mountain ski area, are oriented NW-SE at the northern base of Mammoth Mountain. 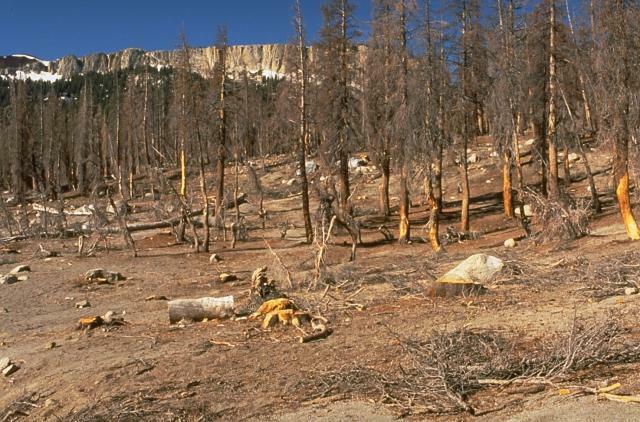 An area of extensive tree kill at Horseshoe Lake, SE of Mammoth Mountain, is seen in July 1998. Dead trees on the NW side of the lake contrast with undamaged trees on the opposite side of the lake. The Horseshoe Lake area is the largest of seven areas of elevated carbon dioxide concentrations located on the southern, northern, and western flanks of Mammoth Mountain. Trees began taking up of magmatic carbon dioxide in early 1990 following the 1989 Mammoth Mountain earthquake swarm. Red Cones, here mantled in winter white in a telephoto view looking SW from Mammoth Mountain, are two young basaltic cinder cones in the eastern Sierra Nevada Mountains near Devils Postpile National Monuement. The youthful-looking cones are Holocene in age. Photo by Paul Kimberly, 1997 (Smithsonian Institution). Red Cones, two closely spaced basaltic cinder cones SW of Mammoth Mountain, near Devils Postpile National Monument, are youthful unglaciated cones that were erupted about 8900 years ago. The two breached cones fed lava flows that joined to form a flow 2 km long and 2 km wide. The southern cone is seen here from the flanks of the northern cone. 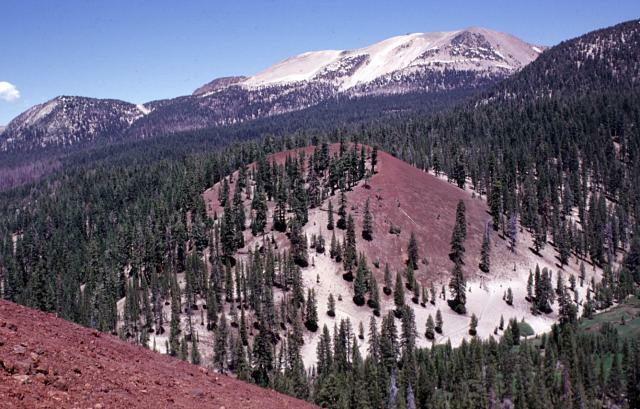 The reddish oxidized scoria of both cones is mantled by light-colored pumice erupted from the Inyo Craters about 650 years ago, visible here at the base of the northern cone. Mammoth Mountain, a Pleistocene trachydacitic lava-dome complex constructed on the SW topographic rim of the Long Valley caldera between about 200,000 and 50,000 years ago, forms the broad peak on the horizon. 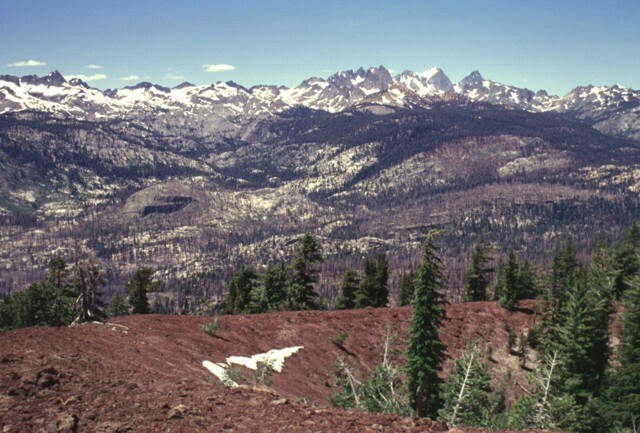 The Red Cones (center and lower left) are part of series of about three dozen mafic cones surrounding Mammoth Mountain. 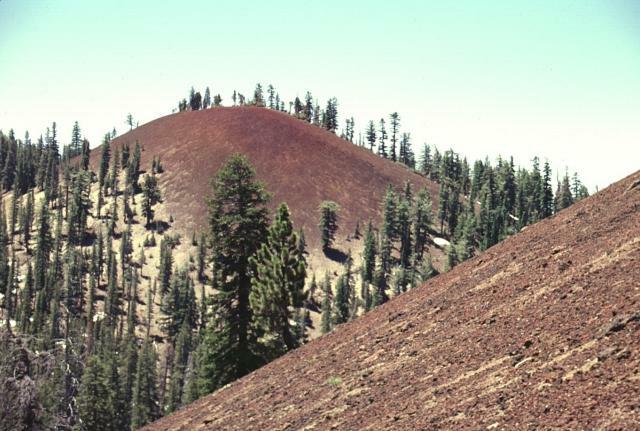 The oxidized reddish scoria of the cone, which was formed during the early Holocene, is mantled at its base by light-colored pumice erupted from the Inyo Craters about 650 years ago. The rugged Sierra Nevada mountain range rises beyond the reddish rim of the southern cone of the twin Red Cones. The southern cone is breached to the NW and fed a lava flow that joined with one erupted from the SW breach of the northern cone to form a flow 2 km long and 2 km wide that traveled west to Crater Creek. Devils Postpile National Monument, with its spectacular columnar-jointed basaltic lava flow, lies along the Middle Fork of the San Joaquin River, below the rugged Minarets and Banner Peak on the horizon. There are no samples for Mammoth Mountain in the Smithsonian's NMNH Department of Mineral Sciences Rock and Ore collection. Large Eruptions of Mammoth Mountain Information about large Quaternary eruptions (VEI >= 4) is cataloged in the Large Magnitude Explosive Volcanic Eruptions (LaMEVE) database of the Volcano Global Risk Identification and Analysis Project (VOGRIPA).